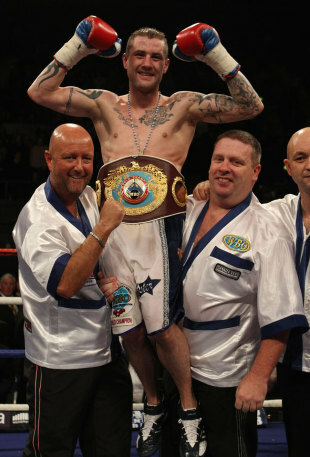 There is little doubting that Ricky Burns is a throwback as a fighter, both as a man and as exponent of the noble art. Ricky Burns vowed after deftly outpointing Australian slugger Michael Katsidis at Wembley Arena on Saturday night that he intends to move up through the divisions and rack up a century fights before eventually hanging up his gloves. Burns has not looked back since upsetting Roman Martinez to claim the WBO super-featherweight crown last year. That victory over the Puerto Rican banger was a career-best performance at the time but Burns surpassed that performance, showing maturity, skill and heart to comprehensively out-box world-class operator Katsidis and win with scores of 117-112 and 117-111 twice. Burns used his jab superbly to create attacks of his own, moving to 33 wins and two losses. “I think I proved a lot of people wrong,” said the Scot. “There was a lot of talk about Michael walking all over me. The Scot’s 35th contest will go down as the best of his career, with a step up in both weight and class in London to defeat Katsidis and add the interim WBO lightweight belt to the super-featherweight title he recently relinquished. He is in a great position, under promoter Frank Warren. The 28 year-old from Coatbridge is one step away from being recognised as a two-weight world champion. To be upgraded to full champion status he must either defeat veteran Juan Manuel Marquez - who fights Manny Pacquiao at welterweight in a trilogy fight at the MGM Grand, Las Vegas, next Saturday - or could be presented the gilded strap if the legendary Mexican boxer gives up the WBO lightweight crown. As Burns’s stock continues to rise and he operates at an elite level he is unlikely to enjoy enough regular action to reach such a milestone. Chief support at Wembley Arena was provided by local man George Groves. The unbeaten Hammersmith prospect retained his British and Commonwealth super-middleweight titles in his 14th professional fight with a brutal second-round stoppage of former champion Paul Smith. After an otherwise cagey opening round ended with Groves taking a blistering right hand, he seized the initiative in the second to floor Smith with a crashing right of his own. Smith somehow beat referee Victor Loughlin’s count. But when Groves followed up with a similarly hard right and Smith was downed again, Loughlin dispensed with the count and waved it off. Ricky Burns' love for boxing runs so deep he says he wants to rack up 100 fights before walking away from the sport. The Scot produced a disciplined display to outpoint the aggressive Michael Katsidis and claim the WBO interim lightweight title at Wembley Arena. Making his debut as a lightweight, Burns withstood relentless advances from his Australian foe and was rewarded for his cleaner work by taking the contest on all three judges' scorecards. The 28-year-old, who relinquished his WBO super-featherweight strap to move up to 135lbs, will be a recognised two-weight champion if he beats Juan Manuel Marquez - who is preparing to take on Manny Pacquiao on November 12 - or should the Mexican legend vacate his WBO crown. After such a bruising encounter, rest is all that is on Burns' mind, but he is already planning on enjoying a long and successful career. "This fight was so much more comfortable for me, moving up," Burns said. "It means no more boiling down to make the weight because for my last couple of defences of the WBO super-featherweight belt I was really, really struggling. "I'll have a wee break and whoever I fight next, so be it. I want to have a hundred fights. That's how much I love boxing. I've always said I'll never, ever leave it and as long as I'm not getting hurt then I'll keep fighting into my late 30s, definitely." While Burns, who took his record to 33 wins and two losses with victory over Katsidis, enjoys his first win in a new division, his trainer Billy Nelson is already eyeing more success in another weight class. "I know it's premature but I do believe he can move up again and win a world title at light-welterweight," said Nelson. "He looked massive in that ring. In maybe 18 months or two years he could go up again."